E-Cig Ban: Madison added E-cigs to the smoking ban meaning no more vaping in Madison clubs. Rökker Vodka: RV is helping to sponsor the 2nd Annual Project Famous Screenwriting Competition at the High Noon Saloon in Madison on Sunday, February 8th. Winners will be announced as well as performances by Gallant Ghosts, Dana Perry, and Joey Broyles. There will also be a showcase featuring local independent filmmaker’s current projects. The cover is $10 and Ian’s Pizza will be served, for more go to Facebook Event. Adventures with Nikko & Lizzie: Congrats to Madison East Poms Team who entered state competition for the first time. Though they didn’t place for an award, the fact that they went from starting the team to competing in just two seaons is a tremendous feat. Trophies are in your future! Happy Birthday to Nikko. He turned 12 last month and is officially taller than his sister. We keep practicing the 12 Great Grooves on drums as well as learning “When the Levee Breaks” by Led Zeppelin. I’m learning the bass part. Nikko has become infatuated with cars, especially sports cars like Ferarri, Lamborghini, and Bugatti’s. 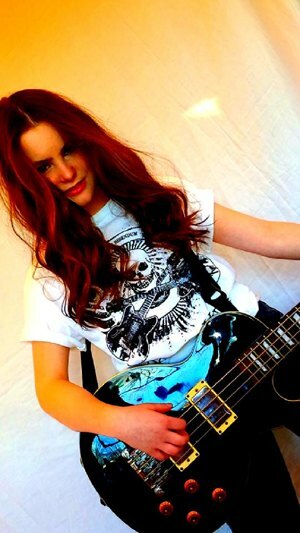 Here’s a picture from a fun photo shoot I did with Lizzie sporting a new t-shirt and shredding on the bass guitar.